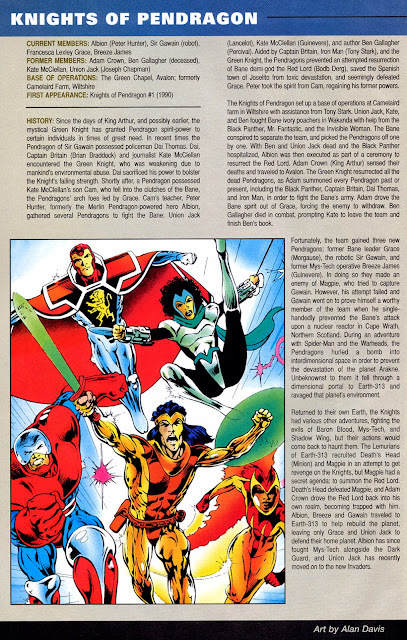 The Knights actually predate the GENESIS 92 project, they made their debut back in 1990 in their own pre-GENESIS US format monthly. That book (the complete run is available in a must-have Panini trade) clocked-up an impressive eighteen issue run before being canned by a combination of marginal sales and the new broom of the incoming Neary regime. A revamped Knights returned the following year as part of the inaugural GENESIS 92 line-up, reprinted in the pages of OVERKILL in the UK. That book - which many fans of the original didn't exactly take a shine to - was a slow burner of the G92 line and eventually clocked-up a 15 issue run making it more successful than some of its higher profile companions.